Finding a quality dog friendly holiday cottage that ticks all the boxes can be difficult which is why we have made it our business to help those looking for pet friendly accommodation in the Gower or Brecon Beacons area of South Wales. 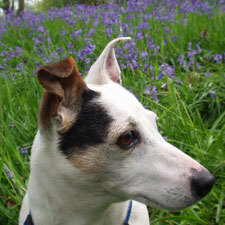 We accept pets in two of our self catering cottages – Bwthyn y Saer and Ty Cerbyd. “Our dogs must think that they have been to dog heaven“. If you are considering Welsh holidays with pets, then the central South Wales area is a very popular destination for dog-owners. The Gower Peninsula is easily accessible from our self catering cottages – many of its beaches allowing year-round access for dogs. These include Rhossili, voted Britain’s No. 1 dog-friendly beach by The Times. Plan which beaches to visit using the official list of the dog-friendly beaches on the Gower. One of the highlights for many guests who use our dog walking holiday cottages in Wales is their proximity to ‘Waterfall Country’ in the Brecon Beacons where it is possible for you and your pet to walk behind a waterfall- a truly exhilirating experience. 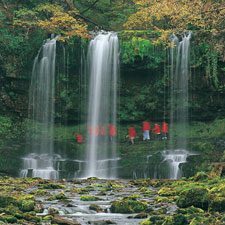 The tallest waterfall in the National Park is Henrhyd Falls, which is less than 20 minutes from our accommodation. There are some lovely pubs in and around the village of Pontneddfechan which is also where you will find the Waterfalls Centre. 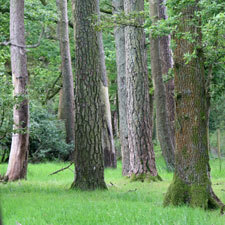 Many dog friendly circular walks start here. It is Plas Farm’s location that makes it so unique. It is situated at the very centre of South Wales – between the sea and the mountains, not too far from the motorway (5 miles) and close to local amenities in the local village (Rhos), town (Pontardawe) and city (Swansea). Combined with over a hundred acres of idyllic private grounds (mountain stream, bluebell woodland, hillside areas with panoramic views), this makes for a very special holiday destination for you and your pet. 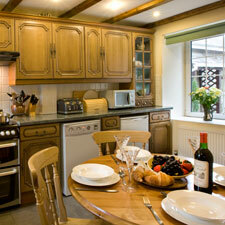 Our pet friendly cottages have been graded 4 and 5 star by Visit Wales (the national tourist board).